Nadal on board his MCY 76. All Nadal images courtesy of Massimo Ferrari. Porto Cristo in Mallorca is Nadal's home. Image courtesy Shutterstock. Nadal uses afternoons on board to relax after training. Nadal likes to take the helm under the supervision of his captain. Nadal tends to keep his cruising grounds to the stunning Balearic islands. Image courtesy Shutterstock. 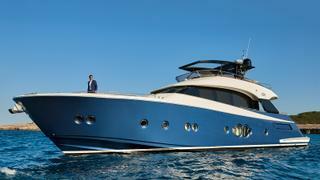 Yachting helps Nadal forget about the stresses of tournaments. How does one of the world's greatest ever tennis players relax after he’s left the court? Now we know after sitting down with Rafael Nadal, one of only eight men in history to win all four Grand Slam events. And not just once – he’s won the French Open a record 10 times. Every chance he gets, Nadal heads to Mallorca, his home island, to rendezvous with Beethoven, his new Monte Carlo Yachts 76. Bought a year ago from the shipyard based in Monfalcone, Italy, Nadal has spent a year getting to know his new yacht, cruising the waters of the Balearics to unwind from the intense pressure of the professional tour. What are your first memories of being on the water? I don’t remember the first but I have a lot of great memories being with my family and friends, spending days on the water around Mallorca, and crossing to Menorca and coming back the same day. 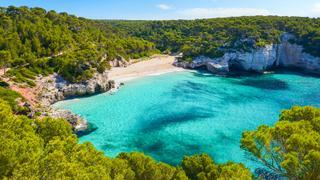 Growing up in the Balearics, do you think you were always destined to love the sea? Well, that’s my world. I have always lived near the coast, between Manacor and Porto Cristo. My father, ever since I was a kid, had a small boat and I loved to go out with the boat and dive. Every time I have the chance, I come back to Mallorca and get on the water. I have always loved the feeling of adventure a boat offers you. You feel free. You’ve owned Beethoven, your Monte Carlo Yachts 76, for a year now. What were you looking for in a boat? I visited a lot of different yachts, and the MCY 76 seemed perfect for the kind of life I like to lead on board. The use of space is different and unbelievable. The main saloon is totally open and not like other boats where there is a living area, then a closed galley and a separate helm position. I like the fact that I can sit in the saloon and see out the front; it makes the boat feel bigger. The aft cockpit, too, feels bigger than on other yachts in the class. The same goes for the flybridge. I love the exterior, of course, but the interior is also very important because it’s like a house for me. Even if I am staying in Porto Cristo, I sometimes come on board and live here. Did you make any specific customisation requests? I changed the main saloon a little bit, and opted to move the galley to the lower deck. I added an extra sofa at the back of the saloon in place of the standard dining table. With the doors open, it’s a great place to sit and you really feel in touch with the water. You only use an interior dining table in winter; in summer, you can eat on the aft deck, up on the flybridge or on the bow. [For] when we do want to eat inside, I had a removable table inserted. I spent a lot of time thinking about this solution, which also means we can swing the TV out and watch it from the aft cockpit. After dinner, if the weather is good, I like to stay outside and watch TV. I think this is perfect. Have you owned boats previously? We have a Riviera, which we use for fishing. My father uses it the most. Before the MCY 76 I had a Princess V62. I enjoyed that boat, but this is another step up. How do you use the boat? Lots of different ways. Even in the winter, for example, I finish training at three in the afternoon and I say “OK, I’ve done enough”. I check the weather and if the conditions are good I say to my captain “Let’s go!” and we spend the afternoon on the water. I put my neoprene on and go snorkelling in the bay, I have dinner and sleep on board. The next day, early in the morning, I come back to port and head to training. I do that a lot. When I have more time I love to go for whole weekends or even for a whole week. But I’ve only had the chance to do this once or twice. Do you bring other tennis players on board? Andy Murray came and used the boat with his team for a few days, but I wasn’t on board. I have been on board with Feliciano López, Marc López, David Ferrer and Juan Mónaco. A lot of the Spanish players come here to practise and we always go out on the boat. I was with the footballer Fernando Llorente on the boat last week. Everybody who comes on board is always very happy. Have you got a favourite corner of the boat? It depends on the time of day. I love the flybridge – the views are fantastic. The bow lounge is amazing, too. When I bought the boat I wondered about installing some handrails around this area, but the yard told me: “You can do it if you like but we don’t believe it’s necessary.” They were right – you don’t feel like you might fall off. I like to relax here when it is not too warm during the day. Do you use a captain, or helm yourself? I have a captain. I need a captain, since I am not here all the time. My captain is a great friend, ever since I was a kid. When I come home and sometimes my friends are working, my family is working, my girlfriend has to work, I just go out with my captain. I don’t have the licence but when I’m there with the captain I do like to drive the boat. In fact, I love it. Do you keep a lot of toys on board? I don’t have a lot of water toys. I have a Williams tender and I used to have a jet ski too, but I don’t have it any more. The first time I was cruising, I was travelling with the Williams and the jet ski and, at the end of the day, the jet ski was bothering me. I am simple – some water toys are great but I simply just get tired of them. What are your favourite cruising grounds? Normally I stay between Mallorca, Menorca, Ibiza, Cabrera... all around the Balearics. You have to watch the weather around here, however; conditions can change quickly. Last year we were coming back from Ibiza and we had very, very rough conditions for an hour and a half. The waves were coming over the boat, but I was happy to be out in those conditions and see how well the boat reacted. 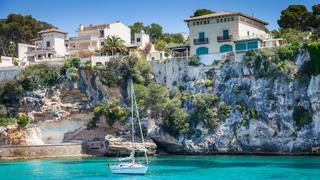 What are your cruising tips for the Balearics? In Mallorca I think there are two kinds of places. On the west side we have the mountains, Serra de Tramuntana, which are amazingly beautiful, but it’s true that there are not many beaches. On the east coast it’s much flatter and there are lots of beaches. I like both things. For restaurants, I love Sa Punta. It’s close to my house, about 15 minutes away, close to Costa de los Pinos. In Puerto Portals I love Restaurant Flanigan. What constitutes your cruising wardrobe? When I am on the boat I am not worried about what to wear, especially during the summer. If I go out for a couple of days, I take a few things from my house to wear to dinner. But during the day I wear swim shorts and a T-shirt, or just the swim shorts. When you want to be comfortable, you don’t worry about what to wear. As someone with a high-pressure, high-profile sporting career, how does yachting help you mentally and physically? I don’t think it helps much physically. The only thing that I can tell you is that, because I have a yacht, I am able to forget about everything and get away from that tiring stress. Doing things that I love to do and enjoying those two days snorkeling, or spending time with friends, or playing, going out with the boat and visiting places, walking through the mountains. I love that. When I wake up in the morning, the first thing I do is get in the water, then come back and have breakfast in an unbelievably beautiful place. That’s something that, without a doubt, helps me return to the world with more energy. Have you spent much time on superyachts? I don’t spend too much time on superyachts, but I do have a real passion for them. It is rare that I see a superyacht from a distance and I don’t know its name. I know them all! In 2012 I had the chance to visit the Costa Smeralda on Larry Ellison’s yacht Senses. I adore him, he was unbelievably kind. We spent eight, nine days there. It was an amazing experience, one of the best ever. I also spent a week on a 56 metre Perini once. I also visit a lot of superyachts, but it would be stupid for me to buy one at the moment. I could not keep it here in my home port, and I don’t have the time. In a bigger boat, everything is a little more complicated, so it’s simply not the right moment for me. Have you got a single favourite memory of being on board? I remember a holiday I had in the northern part of Mallorca, up to the north of Serra de Tramuntana. It was just before the summer. There was nobody there and the water was fantastic. The season was almost starting and I went all around the island for two days after coming back from the Miami Open. It was incredible.